Simple pocket-size scripture booklets can be a great blessing, whether to help us memorize bible verses, or remind us of God’s promises during difficult times. They are also a great way to share God’s Word when visiting the sick or lonely, or as a small gift enclosed in a card or letter. We use various commonly accepted modern versions of the Bible that can be readily understood by all ages. Each of the following booklets can be downloaded free of charge, and printed out onto 2 pages (double sided), then cut and stapled together – see Instructions for Promise Book*. Promise Book – Each Promise Book contains about 70 encouraging Bible verses, grouped in themes including salvation, forgiveness, encouragement, healing…. It is also useful for new believers who are unfamiliar with or unable to obtain the whole Bible. It is easily downloaded and printed onto two sheets of paper (double-sided) and then cut in half, folded and stapled – making it easily reproducible in any country. We now have it translated and available in SIX other languages and hope to have more available soon! God’s Guidance for Graduates – This little booklet contains over 60 Bible verses to encourage young people as they leave school and head out to face their future in a job or career. It covers topics such as God’s guidance for your job; for relationships; for finances; for personal growth and for Christian witness. Scriptures are taken from the New International Version and New Living Translation of the Bible to make for easy understanding by young people in any country. 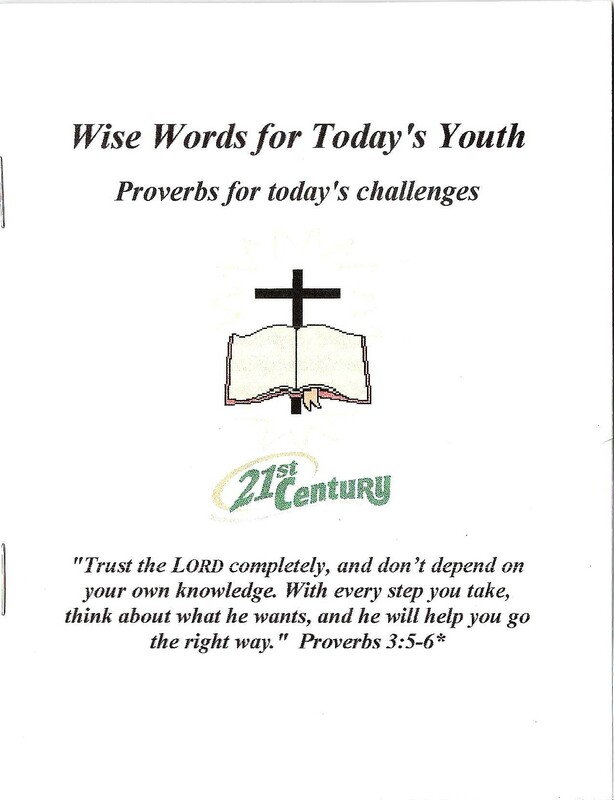 Wise Words for Today’s Youth – This little booklet contains over 90 verses from Proverbs, especially chosen with young people in mind (although useful for all ages!). The verses are taken from the New Living Translation and the Easy-to-Read Version of the Bible, to make them more applicable to today’s challenges and easy to understand. Sections include: Quick quips and wise truths; Words of warning; Promises from God; and Godly advice for daily living. Mini-bibles – We have developed a series of four illustrated mini-books that are especially useful in ministry to children and youth. Each is printed on a single sheet of paper (both sides), and then cut, folded and stapled – again making them easily reproducible in any country.